I feel like my life is split in two and I have double personalities. There is one part of me that is happy and thankful and one part of me that is so completely heart broken and miserable. You'd think it'd be hard to be such extreme opposites at the same time, but I've mastered it. I can go through my days feeling so happy and blessed because of the opportunities I've had. I had the most amazing 11 months with the most amazing little boy. He brought us so much joy and happiness. He truly taught me the meaning of life. I feel like my life before Noah was wonderful, but I did not know true happiness until being a mom. I feel like my life really began after we had Noah. All the prior events in my life brought me to that time, but being a mom is like no other. Looking into those beautiful blue eyes and kissing those sweet chubby cheeks and knowing you made that little person. It's an indescribable feeling. I never wanted it to end. I even remember kissing Noah so many times in a day that I once thought, "if there is ever a time I don't get to kiss you, at least I'll feel like I got all my kisses in." Sadly, I am now at the place where I don't get to kiss that beautiful face and I absolutely do NOT feel like I got enough kisses in. Having Oliver brought back those feelings of motherhood all over again. I now look at Oliver and just squeeze him and kiss him and snuggle him to the point that he is probably so sick of me :) I tell him, "you may get sick of my kisses, but I am never going to stop. I made you, I grew you in my tummy for 9 months so I get to do whatever I want :)" I feel so blessed to have this second chance. To have a baby again and I pray everyday nothing happens to him. Being at home with him right now is such a gift. I went back to work after 10 weeks when I had Noah, so to have spent 5 months at home with Oliver has been so much fun. It's definitely tiring - I never understood how stay at home moms were so tired. I always thought, "what do you do all day?" Well, trust me - the days are full and I'm exhausted! But I wouldn't trade it for anything in the world. I get this feeling of pride when Oliver learns a new trick because I know I taught it to him. With Noah I figured he picked up a lot of what he learned in daycare and through other kids. We are just having so much fun together. I am starting to look for jobs so I will be going back to work, but I hope to find something flexible. But with all the happiness I've experienced, I have also experienced the worst pain a person could ever go through. I lost a child. I lost my own flesh and blood. My own creation. 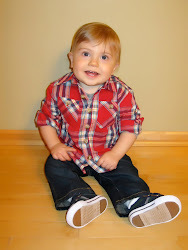 A beautiful 11 month old boy that Scott and I brought into this world. I still have his handprints on my windows, his spit up stained shirts - he was here. He was real. As long ago as it may seem. It feels like an eternity since I saw that smiling face. That face that lit up every room and every person. Everyday I am heartbroken. I am broken. The pain is so real and so deep that sometimes I can't even "go there". It's too painful. I think people think because we've had Oliver and they see how happy we are that things are ok now. Sadly they will never be ok. We are happy and we feel so blessed. But I also feel so robbed. So robbed of being able to have my 2 boys that are 2 years apart. I watch Oliver with other kids. He laughs at them and smiles at them. It is so unfair that he can't have his older brother here to play with him. I cannot imagine my life without Oliver but he doesn't replace Noah. They are both my sons and hold equal love in our hearts. I wish this wasn't the life that was handed to me. I wish I didn't have to experience this daily pain. But I do feel stronger (and older! Yikes! I have definitely grown some gray hairs in this process). But it's a strength I wish I didn't have to endure. I hold strong to keep my family together and to keep my friendships and all other aspects of my life as "normal" as they can be. But it is hard because sometimes you just want to scream and cry. This is a never ending journey. We are growing and evolving and changing each day. But our love for our boys never changes. And we never forget the incredible memories we made with Noah. And most of all we are so thankful for the never ending support from our amazing friends and families (and even strangers!). Those people know that no amount of time will ever make this easier. That we need constant support, prayers, and most importantly to know that people are still thinking of our sweet peanut. That he changed their lives for the better. That means more than I could ever tell you. Jenna- I love how you wrote almost exactly what we spoke about recently. I know writing it down, speaking about it and screaming it out loud helps lift the heaviness you feel in your heart. But it does not make it go away. Keeping Noah's memories, journies, accomplishments, and Joy alive is what helps remind people that he was a big part of your life and will continue to be, "always". I admire your strength, your will and that you can speak your mind. Never change that! WE LOVE YOU and think of you everyday. Payton misses Ollie, so lets plan another date. I can relate to the feeling of having double personalities. I put on my happy and strong face at work and then the real me comes out at home. It is so hard. I understand completely. I feel like I'm living a double life or like the time we had with Julius was all just a beautiful dream. I wish our boys were still here. Thinking of you and Noah each and every day! I never met you or Noah, but ever since I read his story last October, I think about him every single day. His story made me appreciate EVERY SECOND I spend with my 10 months old son. Thank you Noah for changing my life. Your memory will live on. I promise.